"Cri inacheve? 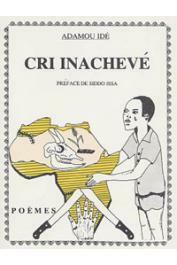 ": Adamou Idé's first book of poetry from 1984. There’s little in English about or by him, but his 2005 appearance at the Medellin Festival of Literature brings us one of his poems, translated into English. The poem, “J’ai Peur” (“I’m Scared”) is a sparse, hard indictment of the general, the dictator, and the presidents everywhere in this world today, who crush the joy from our lives because of their own fear of our power. One of the festival’s amazing collection of African poets reading their works, shows Adamou reading this. I say it: I’m scared!